Uruguay is unique in the world, with having 3 official banners! So, their origins. In 1811, Jose Gervasio Artigas led a successful revolt against Spain, and in1814, set up a new Republic, with himself as its Protector. However, Portugal became alarmed at this, and with Brazil's tacit support, launched an invasion, and subjugated Uruguay by 1820, and it was annexed by Brazil in 1821. In response, a military revolutionary group called the Thirty Three Orientals launched its insurrection against Brazilian rule, and ended up with Argentina supporting their rebellion leading to 500 day Brazilian-Argentina war. Neither side could claim a decisive victory, and finally, in 1828, the Treaty of Montevideo saw the creation of a new Uruguayan state. This treaty was formally fostered by the United Kingdom. One of the three banners is in honour of the Thirty Three Orientals. A horizontal tricolour of blue, white, and red. 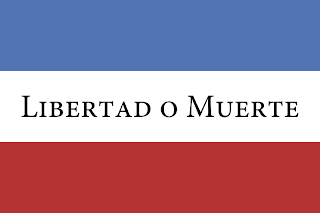 With "Libertad o Muerte" Liberty or Death. The national motto. Another banner is the Flag of Artigas, paying homage to Jose Gervasio Artigas who led Uruguay to independence the first time round. This flag is another horizontal tricolour of blue, white, and blue. Overlaid with a diagonal red stripe running from upper hoist to lower fly. 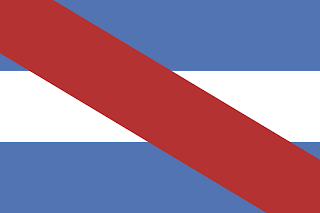 This flag, traditionally, has been commonly used by Uruguay's military, and provides the inspiration for the Air Force's roundel. The flag of Uruguay itself was introduced in 1828, and consisted of a white upper canton, and had 17 white and blue stripes. In the upper canton, an image representing the Sun of May. The Sun of May features 16 rays, alternating between straight, and wavy. In 1830, another law was passed limiting the number of stripes to 9. The 9 stripes represent the 9 original departments of Uruguay. 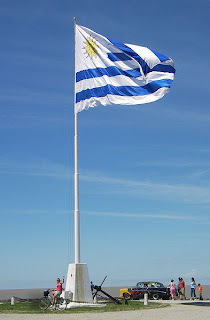 The flag of Uruguay is unique in that the majority colour for the stripes is white, unlike most other nations which have flags of multiple stripes that use white as a divider between another colour, such as the US flag.